Constantly changing technology, the pervasive global information environment, and emerging ways of sharing knowledge are all creating opportunities for new learning experiences. Learning space planning is enriched by robust user input, participants with a desire to take risks, and exploration from the perspective of user experience. Projects that are grounded in user research can develop insights and a deeper understanding of learning interactions to help inform planning. For the IIT Institute of Design, a graduate program that teaches design thinking and innovation planning, we observed how student teams transitioned between analog and digital media and how they used spaces. The study developed an analytical framework, a set of planning principles and a proposed palette of settings for virtual collaboration to support a more globally distributed program in the future. For the new “LInC” Learning Innovation Center building at Oregon State University, the visioning process was organized around two pedagogy charrettes. We collaborated on design of a custom card workshop tool that helped facilitate the adoption of radically new space models, which applied active learning design principles to teaching large scale classes, bringing the instructor closer to students. The building design by Bora Architects reflects the early consensus of participants to have a rich mix of teaching space types, a blending of informal and formal learning spaces, and integration of teaching and learning support services staff into the top floor of the building. Many projects have become a dialogue between the evolving vision of how teaching would change and how new kinds of environments could foster those desired pedagogy goals. These projects involved not only transitioning from lecture-based teaching to more active, team-based learning, but also rethinking the curriculum structure to introduce more hands-on experiences, professional practice at an earlier stage, and community spaces designed to bring together a mix of students from all levels. The early trends we saw in health science education are now becoming part of the wider educational mainstream. Univ. of Virginia Claude Moore Medical Education Building, which was programmed to support their new “Next Generation Cells to Society” curriculum, with a learning studio for 160 (the largest at the time), a simulation center and a clinical skills center. Stanford Li Ka Shing Learning & Knowledge Center, which incorporated active learning studios and a state of the art simulation center for their “Discovery” curriculum. 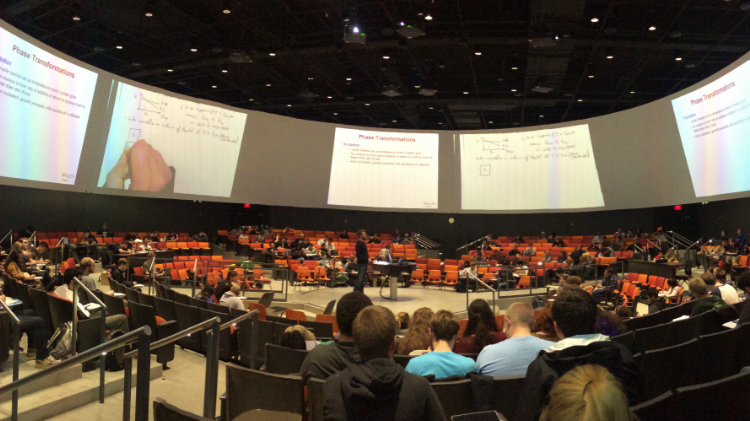 Although campuses evaluate their classroom stock in relation to numbers and sizes of classrooms needed for academic programs, the trend to flipped courses creates pressure on the system because active learning layouts require more space per seat and conversion reduces capacities. In the future the use of physical campus space may also shift as virtual participation in discussions becomes more prevalent, team work on projects gets done outside of an assigned class time or room, and other changes. Developing a strategic approach to transitioning existing space over time and considering how physical campus space may be used in the future can be an important enabler. A process for Santa Clara University involved pedagogy workshops with faculty and students, a survey to faculty about their teaching aspirations, and prototyping workshops to develop a palette of recommended space types. 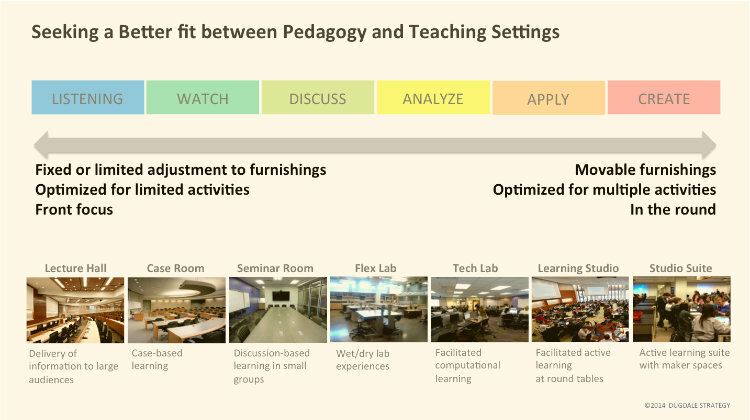 A roadmap for a series of pilot spaces tested concepts and furnishings in renovated rooms prior to design of new facilities. Roadmaps for prototyping can be an integral part of a planning process—from early “sandbox” workshops, to scale mockups, functional prototypes, or model pilot spaces. Experimental teaching spaces provide flexibility to test new methods and research about learning. They can accelerate change by demonstrating the need for reduced density and greater flexibility in teaching spaces, by providing bookable space for instructors to try before committing to course redesign, and by promoting the essential ecosystem of integrated support services to drive change. 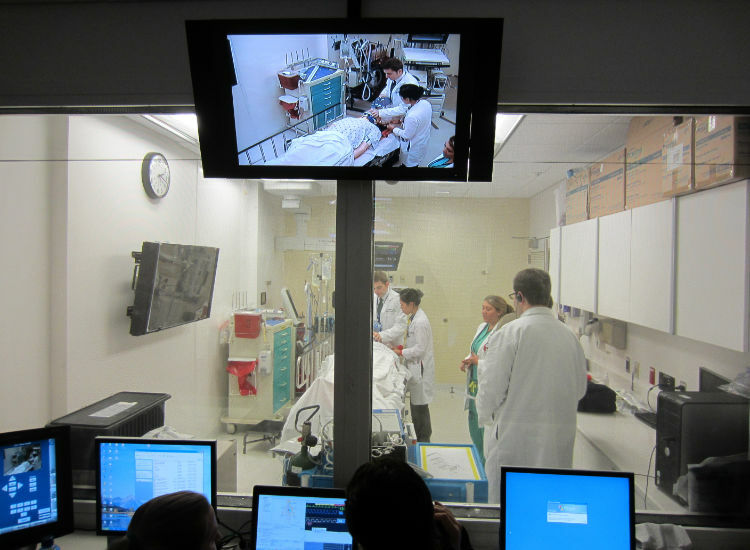 Simulation offers many new experiential learning opportunities in diverse fields, especially those involving team dynamics. By studying the learner journey through simulation experiences, we gain insights about planning training spaces and desired sequences of activities. As virtual simulation and augmented reality techniques become more robust, learning experiences in many fields will become richer, generating new types of space requirements. Our programming for a next-generation interprofessional simulation center for Johns Hopkins Hospital envisioned a full range of typical hospital and clinic settings, enabled for research on effectiveness of simulation for training for patient safety and assessment.